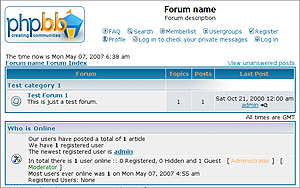 phpBB is a high powered, fully scalable, and highly customizable open-source bulletin board package. phpBB has a user-friendly interface, simple and straightforward administration panel, and helpful FAQ. Features include: Unlimited forums and posts; Multiple language interface; Private or public forums; Powerful search utility; Private messaging system; Templates.